The 64-gun ship may lack some of the firepower of the other ships-of-the-line, but it still has a respectable broadside, and can be constructed at a lower cost. It can be regarded as a stepping stone between 50- and 74-gun ships, with more broadside weight than the first yet with a faster reloading time than the second thanks to its lighter cannons. Opinions differ as to whether this is a happy compromise. The Royal Navy classed a 64-gun ship as a “third rate” ship, normally a classification reserved for 74-gun ships. Although small, the 64 was not without supporters: Captain Horatio Nelson’s favourite ship was HMS Agamemnon, a 64 built at Bucklers Hard in the New Forest. His crew, often called Agamemnons, loyally followed Nelson to his subsequent ships and successes. 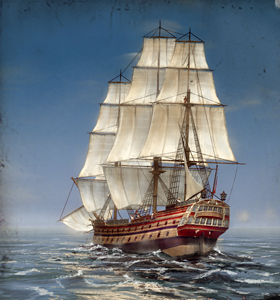 The Agamemnon itself was used by the Royal Navy during the American and French Revolutionary Wars, the Napoleonic War and was at the Battle of Trafalgar. After nearly 30 years of hard service it ran aground off South America, but the entire crew survived the wreck. The "Eggs and Bacon", as the crew called it, looked after its men to the last. A dry dock is a man-made basin with a set of watertight gates. It allows the construction of many types of warships.